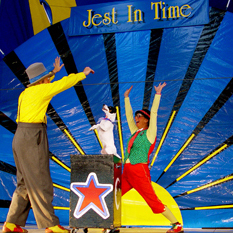 Jest In Time Circus – Appearing under their very own ‘big top’, renowned performers Li Li Zucchini and Topper Todd travel the world entertaining children of all ages with the very best in professional family shows. Their exceptional kids and family shows are self-contained including tent, bleachers, stage, sound and lights and their Big Top can also be made available for other entertainers to use. Comedy Strolling with Topper & Li Li provides walk-around entertainment for all ages: Stilt Walking, riding BIG WHEEL Bikes called Penny-farthings, Ball Spinning or a ‘themed stroll’ created just for your special event.